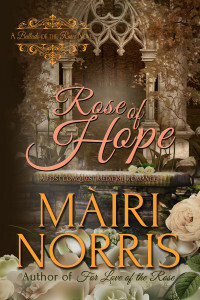 Rose of Hope, the first book in my post-Conquest medieval series, Ballads of the Roses. Available for Nook and Kindle. Evil turns the life of Ysane Wulfsingas, a woman of gentleness and peace, into a nightmare that drives her to murder. When a new enemy, the fearsome knight Fallard D’Auvrecher, charges headlong into her life intent on picking up where her former husband left off, her only defense is to guard well her heart. Captain Fallard D’Auvrecher holds the opportunity of a lifetime within his hand. To keep it, he must rescue Ysane Wulfsingas from execution, for the beautiful Rose of Wulfsinraed is the key to all he has fought for in his years as a knight of King William. Fallard must conquer not only the rebel commander who desires Wulfsinraed for himself, but also the demesne’s serenely obstinate mistress. Though he has waged countless battles, Fallard soon learns the greatest challenge of all is the fight for the lady’s heart.